Alma Claude Burlton Cull (1880-1931). Watercolour signed and dated 1928. Standard size 14 x 24 x ins (36 x 60 cms) approx. Painted here emerging from patchy visibility is the 3rd Battle Squadron, with HMS IRON DUKE (Captain F M Austin RN) in the van wearing the flag of Rear Admiral P H Hall-Thompson CB CMG, Rear Admiral Commanding 3rd Battle Squadron Atlantic Fleet. In line astern are HMS EMPEROR OF INDIA (Captain W F Sells CMG RN), HMS MARLBOROUGH (Captain F C Fisher RN) and HMS BENBOW (Captain S F B Carpenter VC RN). 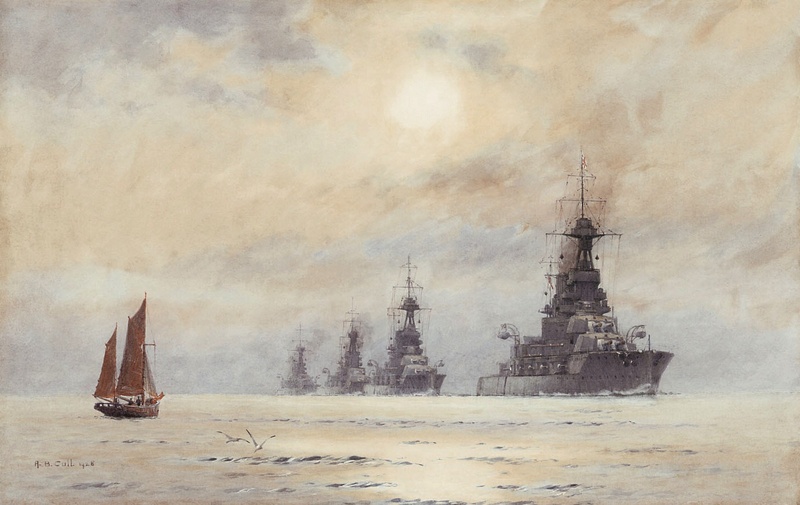 This was almost a final glimpse of these handsome ships for within a few months the squadron would disband with the paying off of IRON DUKE on 30th May for a special refit; and although not forecast at the time, the remaining ships of the 3rd BS would have followed the flagship and within a year paid off too. For them, however, it was to have been their final commissions and none, with the exception of IRON DUKE, would ever to go to sea again. Pressures, both domestic and international, were starting to tell: at home, the Treasury was again pushing the armed services for financial savings and abroad in Washington, a Naval Conference was looming and Great Britain was required to reduce her capital ship force by fifteen hulls. IRON DUKE was saved by being converted into a Gunnery and Boys’ Training ship, although her main armament was savagely reduced to gain her exemption from the Treaty limitations. Her sisters was not so fortunate. A Devonport ship, EMPEROR OF INDIA had re-commissioned for what was to be the last time on the last day of December 1927; 3 years later she was to be towed out of Plymouth for breaking up; it must have been a heartbreaking time for those interested in their navy as she and her doomed sisters were barely 15 years old. MARLBOROUGH had been the flagship of Vice Admiral Sir Cecil Burney, Vice Admiral commanding 2nd BS and although torpedoed at Jutland and suffering significant damage had remained in the line until the action had appeared to fizzle out during the night when she was ordered home to Rosyth for docking and repairs. MARLBOROUGH was also scrapped in 1931. Captain Carpenter of BENBOW had won his VC amongst a hail of lead on VINDICTIVE’s bridge at the storming of Zeebrugge in April 1918. His ship, BENBOW, was laid up in 1930 for 18 months before following her sisters to the breakers: and so within three years of this painting only one of these four beautiful ships was still in service. Alma Burlton Cull is generally ranked second only to W L Wyllie as a marine artist of the early 20th century although his death at the early age of 51 robbed us of many more fine paintings, a loss exacerbated by the bombing in 1940 of Cull’s old studio in which many of his pictures were being stored. He painted on canvas and paper and was commissioned, amongst others, by King Edward VII. The original of this painting is owned by a keen collector of maritime art who snaps up a Cull whenever this rare artist comes up for sale because of the technical accuracy he brings to his paintings allied to his skill with colours, skies and seas.